The average temperature in Winnipeg during the winter hovers around 10.4 degrees Fahrenheit—a number most of would consider cause for hunkering down for the season. In Canada, it's cause for parties. Winnipeg keeps up a busy schedule of outdoor activities, including a four mile skating trail on the frozen Red River, which is often called "the longest skating rink in the world," and hosts everything from curling to broomball. It's also home to a yearly design competition which chooses a new series of shelters to be built along the river's banks—these "warming huts" are part of the festivities, but also serve the very important purpose of making sure people don't get seriously cold while on the trail. It's a hearty 6 degrees in Winnipeg right now, and it's only going to get colder—the city actually chooses the coldest week of the year, statistically, to build and open the huts (it's in January). Check out a few of the newly-announced winners below or see the whole list here. What does this shelter have in common with Wile E. Coyote? It's actually inspired by a 60-year-old episode of Looney Tunes in which the Coyote uses a "hole" to capture the Roadrunner. Of course, it fails—but the architects at Weiss Architecture & Urbanism Limited named their concept after it anyways. They're going to take colorful ridged tubes and wedge them into the snowmass alongside the river, creating warm spots amidst the tundra. A bit like the hole idea, this shelter designed by students at the University of Manitoba attempts to fade into the landscape—by using mirrors, not mounds of snow. 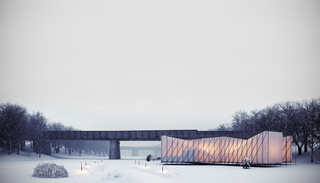 The warming shelter is edged with a facade of one-way glass. Part of the festivities include the construction of a temporary restaurant—yes, a semi-outdoor restaurant—perched on the river for a month. This year it's being designed by the architecture studio OS31, which plans to use off-the-shelf scaffolding to create a framework through which fabric will be stretched to create dining spaces. You can check out the other winners here—construction will begin in January, if you fancy a trip to one of the colder cities on Earth.